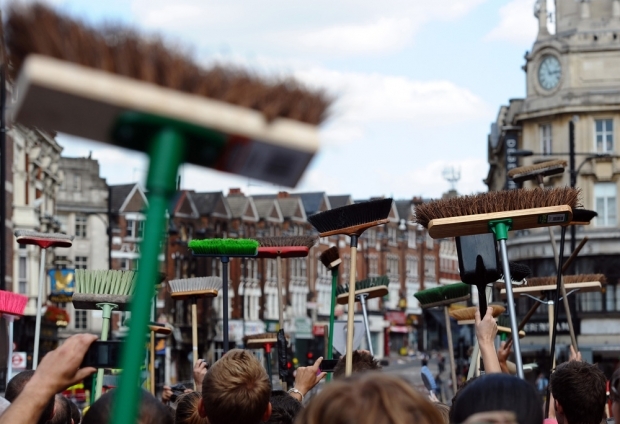 Members of the public show their brushes to Mayor of London Boris Johnson, on August 9, 2011, as they prepare to clean their streets in Clapham Junction, in south London, of debris following a third night of unrest in London. Smouldering parts of London resembled a war zone on Tuesday after a third night of violence with shops looted, century-old businesses burned to the ground, and streets littered with barricades. Last week must have felt good for embattled Chinese patriots. Not only did the United States lose its coveted triple-A rating from Standard and Poor’s, but months after unrest in the Middle East sparked renewed speculation about political disenfranchisement throughout Asia, riots in London suggest the West may have bigger problems closer to home. And China looks to be sitting quite pretty. Or is it? This week on Sinica, Kaiser Kuo hosts a discussion of these issues and much more with Jeremy Goldkorn, Chinese media expert and founder of danwei.com. The two are joined in our studios by David Wolf, President of Wolf Group Asia and author of the popular China tech and economics blog Silicon Hutong. Also sharing her expertise is none other than Tania Branigan of the Guardian, who brings her usual erudition to our discussions of recent developments in China’s western provinces.